This week we'll have winter cold! First thanks to all, who left a "happy birthdaywish" here for Jan. I told him he had wishes from several countries and it made him smile. Yesterday was a quiet day, but nice. I made a kind of "birthday-dinner", hmmmmmm with big shrimps in garlic and parsil and made a potatoe salad to go with it. I didn't had a present for him(we agreed not to buy presents for eachother's birthday), but I collected some music and burned a cd with that, mainly with "oldies". Some of the songs we have, but only on records, and it is nice to have a collection of your favourites together on one cd. On Friday we actually made it to the market, didn;t buy too much, just potatoes and some fruit and a little bit of veggies. It's really getting colder now, and during this week even day temps will not rise above the zero, brrrrrrr. But the good news with it is, that probably there will be little of rain or snow, it should look rather joyful with sunshine. Then I don;t mind if it's colder, I can handle that, if there is not much wind to it. Still hoping that next week temps will rise again, LOL! Oh yes, you know we did watch the speedskating of the World Championship Sprint during the weekend and hoorray, with the men we Dutchies have a champion, Stefan Groothuis. He was so close to it, several times, ending up on second or third place, but this time he finally did it. I am really happy for him, he worked very hard for it. It was very exciting, cause it wasn;t sure who would win the title till the last race! And I am so sorry for my Canadian friends, that Christine Nesbitt didn;t win the title with the women! She raced a spectaculair 1000 mtrs, with a world record!, but yesterday she just lost on 0,02 seconds the title. How frustrating is that???? We all thought she would grab the title, but she lost from a Chinese at the end. Now on to the freebie. 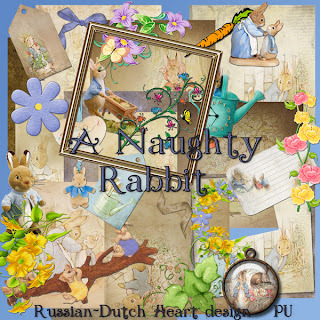 I made another Beatrix Potter kit, the pics are so adorable! 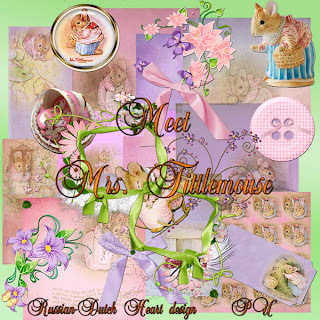 It's named "Meet Mrs. Tittlemouse", and I think it's a great kit for layouts with little kids! A heartbreaking story at the news. Sun is shining at the moment, so it looks a bit cheerful, but that could change over the weekend. They say it's getting colder, hope that doesn;t last too long. I think it was Wednesday evening on the local neews channel (and later also on the other channels!) that I heard of a heartbreaking story. At the moment the government is busy with all immigrants that are here, to see if they are granted a definate permit to stay or not. Okay, it's a good thing they look in to all the cases, because there are always people who want to take advantage of the asylum policy. But thee are also people coming here, because they are in danger in their own country. Well, everybody is a bit familiar with this problem. But the following is absolutely not to comprehend, I took the newspaper article into a translation site, hope I adjusted it well here and there, just read it and I think everybody has to agree that in this case a permanent recidence permit is the right thing to do. "Mr. Abdul is cool and must remain! ' With large letters, the inscription on one of the many posters and banners in the St. Michael school in Hazerswoude-dorp. In the course are groups of children busy with paint brushes painting the name Abdul on large white sheets . The 50-year-old caretaker of the basic school is standing close to it very emotional. Abdul Matin Momand was told last week that he must return to his native country Afghanistan. Although Abdul lives in The Netherlands for more than fifteen years, now his last hope of a residence permit is gone. Per letter Monday all parents and children from the school were informed of the rejection by the IND.I the Immigration department) The news hit like a bomb. "Abdul belongs to the school", says a mother. "He is so much more than just janitor, he lives for this school." Behind her a bunch of guys, in their hands they keep lists full of signatures. "Look", they say proud to the the janitor, "we have many signatures and we're going to get even more." Abdul gets his glasses of his nose and rubbed into his eyes. "This school is my family", he says. "They do everything for me. When I moved to another house all parents have helped . And now they give me support. " Six years ago the wife of Abdul suddenly died . Also then the whole school was there for him. "My wife complained about headaches", he says, "four days later she was not there anymore. Everyone was so caring for me, they brought me food and helped me with everything. " The children of Abdul, Achmed (16) and Diba (15)-obtained years ago a residence permit. If their father is turned off, they will have to remain in Netherlands alone or go with him to Afghanistan, a country that they barely know. "They have to decide", says Abdul. "But they have nothing in Afghanistan. They do not speak the language. The were still babies when we fled to Netherlands. But if they stay here, they will have lost in addition to their mother also lost their father. " The Director of the school is happy that everyone is so involved. "Abdul deserves this. He is like a father to the children in the school. We hope that this positive attention perhaps Abdul can stay here. " 15 years ago Abdul fled from Afghanistan to The Netherlands with his wife and two young children. The Immigration and Naturalization Service (IND) wanted to revoke the earlier temporary residence permits. According to Abdul because he has worked in Afghanistan for Defence. The Court decided three times that Abdul could stay in The Netherlands . Nevertheless, his new application for a permanent residence permit was rejected by the IND. Gert Leers, Minister of Immigration and asylum yesterday announced through his spokesman that he wanted to be informed of all facts about the case . The Mayor of Rijnwoude, where Hazerswoude-dorp is a part of, asked the minister yesterday to look again to this case. Now isn;t it heartbreaking that the government takes 15 years to see if this man is "okay"???? He is fully integrated in Dutch society, works, speaks Dutch, his children even have Dutch nationality, and they just say"sorry, you'll have to go back to Afghanistan". I don;t think that's the right way to treat good willing people.! Hmmm, we will se in the next couple of weeks what will happen. This weekend will be nice for Jan and me. Of course there is Jan;s birthday on Sunday, but there will be no party. Oh gosh, we've grown over that! LOL! But this weekend will be speed skating again, Worldchampionchip Sprint, held in Calgary! So Satuday and Sunday evening will be filled with watching that! Great.!! I'll try to get a new load of laundry done today or tomorrow, may be, if weather stays a bit pleasant, we make a short visit to the market, we'll see and I might even give Jan a quick haircut, so that he will look handsome at his birthday ROFL! Today is the second download from the "Precious Moments" kit, and I'll be back on Monday, already the last day of January oh, and the birthday of our queen too! Have a fantastic weekend and send some positive vibes to our government, they will need that so that they decide with compassion, that Mr. Abdul can stay here in Holland! Sometimes you wish your hubbie could be somewhere else, for a few hours LOL, but there are also times you can be happy with them(and happy to say those times are more frequent ROFL). Yesterday I went out for the shopping and when I came back I noticed, that there were some wet spots in front of the door and window. So I took a good look at the window and surprise ! I was able to look through it! During ny shopping time Jan tackled the window at the front, which was about time to do so, there is of course the "normal"dirt, but the last couple of weeks we had some harsh winds, blowing almost full on the window, and accompanied by rain it left traces on the window, mildly said! You can imagine I was happy with my hubby yesterday! Still there is the inside to do and some other windows, but he mumbled something, that he would do them too this week. WOW! Some minor news about the weather, it's forecasted that in the weekend temps might drop, specially during the noghts, below zero several degrees, but still during daytime they will be several degrees above zero. So perhaps we have to deal with several days of colder temps, but I think(or let's say hope) it will not last for very long. I can remember years, where we had real winter time in March, so everything is still possible. We might have snow and ice as far away as March and even April, not that I would be happy with it! We'll just have to see what the weathergods have in mind for us, don;t we? Time again to do some things here, get them done quickly and perhaps this afternoon I will have a bit of time to spend at the computer, designing I hope. I started another kit, but it's not progressing smoothly. I might delete the few papers I've made till now completely and start all over again. 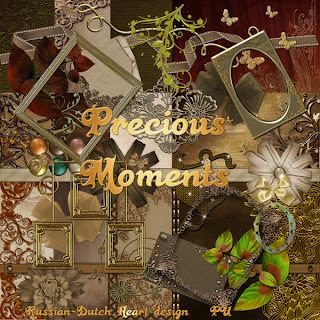 Today I have a first download of the kit "Precious Moments"for you. Second part will be posted on Friday. Hopefully it will inspire you for some great layouts! Yesterday I made up a little for the "lost"time during the week LOL! I changed the bed duvet covers and sheets, let the washing machine do it's work, then I made us some stewing pears for desert and already prepared the sauce for the pasta we were to eat for dinner. It's a kind of Stroganoff sauce, adapted it a little my way. You take an onion, cut in small dices, with some garlic cut very small, bit of oil in a pan and start frying the onion with garlic. When they are almost ready, you put in some minced meat, add some pepper and salt and let that fry, keep stirring. You take a red paprika, cut that in not too small squares, and add that to the pan. Don;t set the fire too high, it has to fry a bit slow. Take some small tomatoes, cut out the "green top" and then cut the tomatoes in dices, add that to the pan. I also added some spring onion to it and and mushrooms, if you like you could add even some olives, or courgette to it. When all is about ready, you could add some crème fraiche to it, keep stirring. You can do all this in advance or at the same time your pasta is cooking. I took the "penne"this time. Well, put some pasta on a plate, add a nice quantity of the sauce and if you like add some parmezan cheese on top. Not a very complicated, but tasty meal. Next time I will make a little green salad to it, it will be perfect then. It wasn't one of Jan's favourite meals, LOL (he isn;t much of a pasta eater), but he said the sauce wasn;t too bad. But I have to admit that my hubby isn't a "difficult"eater. Of course he has his preferences, but he seldom is complaining about the food. What a guy! In general I cook straight forward dinners, but at times I like to try something new, and not always a new recipe turns out the way it should LOL! I suppose I am lucky to have a hubby who eats almost everything and isn;t too afraid to try something different. It's getting time to move around a bit here, the house needs a good vacuum cleaning and there's always to find another job, sigh! But at least the sun is showing every now and then, it makes the world look a lot friendlier. If it stays this way we might even make a quick visit to the market later this afternoon. And now it's freebie time again. 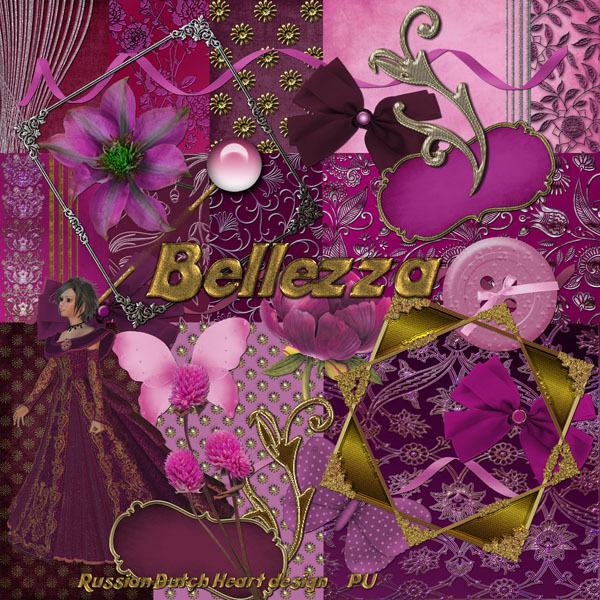 Hope you can use this kit "Bellezza". The last couple of days were very quiet for me, not because I wanted it, but it was necessary. I had a bit of trouble caused by my epilepsy, got a few absences(not that I was completely knocked out, LOL) and then I just have to let them happen and sit them out till it's over again. So I slept a lot, which is the best to do, and spent the days on the couch. Result: not much done those days. I always get a bit pissed off when I have trouble, but there isn;t much to do against it. Perhaps a bit more of the medicine would help, but if I only have a bit trouble every now and then, well, so be it, and I rather stick to the dosis of medicine I am taking now. But yesterday I was "free"of it again, still a bit tired, but I think today I am okay again. Enough complaining, let's just hope this will stay away now for a long period. Hahahaaha, when I have those "attacks"I always think I can control them more or less, at least to a point Jan will not notice. But he always does. Most of the time he says nothing, but I know he knows, cause he stays in my neighbourhood, comes checking when I stay too long out of the room, well, I know by little things. Now that I am "fresh and merry" again, I think I will go out this afternoon, just for a short while, even with not too nice weather it will be nice to sniff a bit of fresh air. Need to get us some bread, cat food just a few things. And then this evening there will be the final of The Voice of Holland. There are 3 very good candidates, difficult to choose between them. I just hope really the best will win it, but the winner is chosen by votes of the public watching the tv, and then they can vote for their favourite by sms or phonecall. I think it would be better if it was decided by a competent jury, than by the public, cause it can happen that one candidate is very popular, because of his attitude or character, , and wins the competition because of that, but not because he or she is really the best "voice". Well, we'll see what happens. Already nest week there is the start of a new Voice of Holland, but this time for kids. Okay, enough bla-bla now, time for the freebie. 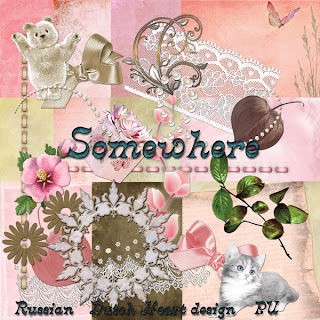 It's a little kit named "Somewhere", in pastel colour. Have a wonderful weekend and see you again on Monday! Surprise, my plans worked out!! For once I achieved to do the things I had planned for Monday LOL! Well, not completely, cause I always got distrackted when I am doing things, hopeless!! But I did the laundry, I ironed all that was waiting for it, and while I was putting away the christmas table cloths etc. I sorted out 3 boxes where I keep the Christmas pillow covers, the table cloths etc and other ones where I keep the usual pillow covers, table napkins, toppers, and such. They look nice and organized again, and hoorray got rid of some old stuff in it, that was never used again. So proud of myself LOL! What remains is the store room for the groceries. Perhaps today will be a good day for it, weather is a bit grey and not looking to inviting. I already did my shopping yesterday, returned home with a load of things, enough for the rest of the week or more! They had a few good deals at the supermarket of "buy one and get two"stuff and I was lucky it were things I really needed to have. I took soup, potatoes, butter for frying, two boxes of dry cat food, all in those 2 for 1 deals. Plus of course still other things for "normal"price. I always try to look for those kind of deals, and when they occure, I first calculate if it's really worthwhile(cause you often can find it for even less money from e.g. another brand), but if it's okay, I take them. It saves some money, which is a treat for my wallet LOL! Well, that's about it for today. I was already a bit late this morning(kind of overslept a bit) so I should get dressed and start doing something. 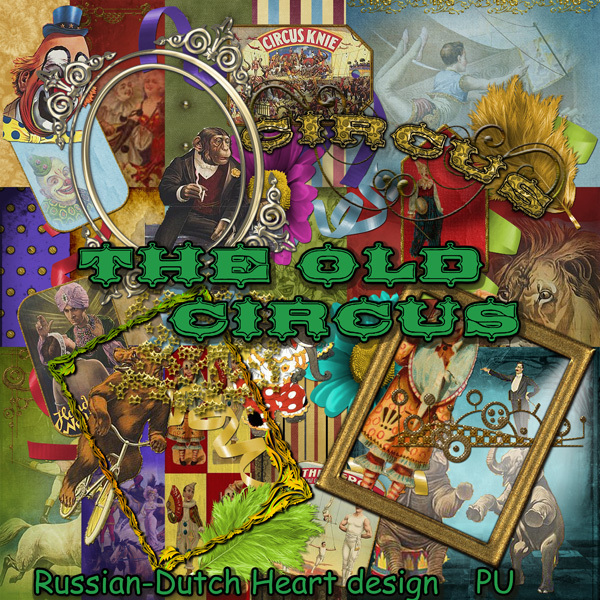 I think I have a fun kit for you today, about Circus life! It's named "The Old Circus". A weekend just flashes by! Friday after posting, I stayed at the computer a little while longer, working on a kit. Then I shook myself up, got dressed, had a sandwich and went doing a bit of shopping, the usual things. Came back, put the stuff away, and tackled the house (well, most of it) with the vacuum cleaner. Dusted a bit here and there, that kind of things. In the mean time Jan tackled our dvd's. Oh gosh, I didn;t know we had soo much of them! Not only in the rack standing near the cd's but also in two boxes on the ground. Jan found another one, bigger, so that is already easier to find one, and I have a bit less stuff on the floor. Saturday I just went out to get us the newspaper, but it was such nice weather, I made a little walk. It was crisp, but real refreshing, wonderful. We watched quite a lot tv, some days there is sooo much to see, on other days you really have trouble, finding something interesting LOL. Oh, as you know we love a lot of different sports, this week there was the world championship of darts at the Lakeside, England. I like to see a good game of darts and wheeeee, some of the matches were really like a thriller. And now the best of it: A Dutchman won the championship! I think it is the 3rd time of the history of the Lakeside it happened. The more astonishing, cause it was his debute at this particular dart competition! In the final yesterday evening out champ managed to beat Tony O'Shea, a very very good dart player! So here we go: Congratulations to Christian Kist, yeah!!!!!!!! During the day, we just did take it very easy, Jan reading the newspaper, commenting on several things written there, to me, when I was playing a bit at the computer, I don;t mind that too much, but it isn;t easy when you are reading something on internet yourself, and your hubby is talking to you and expects some answers or reactions from me on the newspaper issues LOL! You know what I mean?????? Weather is supposed to get a bit colder, even a bit of nightfrost, mainly in the eastern part of the country, but the weatherman also said temps will go up again a bit after a couple of days. So till now, still no snow, how lovely!!!!! 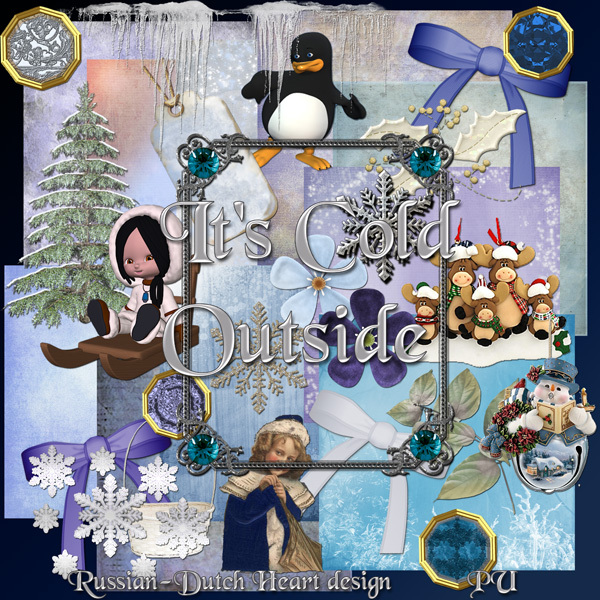 But as in other parts of the world there is a real winter going on I have a kit that might be nice for some real winter layouts, named "It's Cold Outside". Well, after this lazy weekend I should do a little bit of work again in the house. Laundry is waiting, together with some ironing. And maybe, if I have the energy for it, I could clear out the place where we have our groceries reserve standing. You know, tins with veggies, all kind of pasta, some coffee, sugar, the stuff you can keep for a long time. I should check if it all still is usuable, not running out of date for consumption. Sigh, why do we have sometimes the tendency to act like hamsters??????LOL. Whatever I will do,or not, it sure is time to close this post, I have then a little bit of time left to perhaps start with a new kit, and then I first will grab a nice shower, get dressed and get busy! Yesterday evening I phoned my friend with the sick cat. And the little treasure is still there! After she went on Monday to the vet, she was told that it didn't seem to be in pain. She had another medicine to avoid her throwing up her food and it seems to work. The cat has to deal with kidneys that doen;t work well, that will never improve, but she eats rather well, it stays till now in her stomach. So perhaps she will recover a bit, although it may be slowly, but you can imagine that my friend was relieved, the cat still is with her. She also knows it may not be for a long time anymore(the little thing already is about 19 years old), but as long as she knows that it isn't in pain and feeling better again, and comfortable at home, she still can emjoy the company. Today it looks not to be so bad outside. It might stay dry all day, and I even see a bit of sunshine. And with also a bit less wind it might be even nice to go out for a moment. I will have to, to get me a few things from the supermarket. Oh, Wednesday we went to the market, although then the weather was not that good. A bit moist, grey, it felt at times if it was raining, but it was just all the moist in the air that gave that impression. Still it was nice to be outside for a while. We didn;t buy too much this time, only some mandarines(good for the vitamines! ), some Brussel sprouts( they are in the freezer already), and cheese. Oh my, how some of our politicians cna be bothered about nothing at all!!! I'll try to explain LOL. Our queen is visiting a few countries in the MiddleEast, one of them Oman. It's an official visit, so she is accompanied by her son, prince Willem Alexander and his wife princess Maxima and a whole bunch of ministers and business people. At the news, every day they show some of it, and in Oman they visited the big mosque. And now there was big excitement (from one party, the PVV, rather at the right side of the political world, if you know what I mean), who where disturbed by the fact, that our queen and princess where dressed in beautiful long gowns and a scarf around there head. They looked just beautiful in it, but if you visit a mosque it's kind of tradition, and expected, that the women cover there head with a scarf and removed their shoes from their feet.. So our queen and princess adapted to the custom, it's is just a polite and respectfull to do so. But the leader of this party said, it was shocking, because the head cover illustrates the oppression of women in the Islamitic world. I just think he is nuts, so do many other people, still there was a lot of commotion again about it. The more while our queen said in an interview, after being asked the question what she thought of that idea, plainly said"I think that is nonsense". WOW, now that was bold of her LOL! Now the are arguing about this answer, because it might look like a political statement, and it could have consequences in parliament and bla bla bla. I think, our queen knows very well who to behave herself when on an official visit to any country, and I think she acted well. But I think members of the government have other things to be concerned about, like the big financial crisis that is going on, which involves unemplyment, low prices of houses, almost no economic growth, the possible lowering of the pensions, etc. etc. And what if you visit a cathedral, e.g. in Italy, Spain, it's also very much appreciated if the women wear decent clothes, and even a lace cloth on their heads. And so there are more examples. But of course, that isn't the same according to that party! Still, they achieve one thing with it. They are again into the publicity, and I think the press and media should ignore those statements and remarks. Don;t react to it, leave it in silence, and don;t bother! I think that would be the best thing to do. And even more childish they state, they don;t have anything against moslims, but the more against the Islamic belief. Well, I am against any believe, just we have to be careful about the extremists, in any belief or any political party. Live and let live is my motto, and try to be kind to another human being, make an effort to understand another way of living and even if you cannot agree with it, you at least can respect another view. Gosh, this has become a long post, but really, I can be so angry about these things, ROFL! Let's move on to the freebie! I stumbled upon some pictures of Beatrix Potter on Gutenberg. They are so lovely and sweet and seeing them I thought there might be a nice kit in it. So here you have a kit with some pics of Peter Rabbit, I tried to make it look a bit "older" and hope you can use this kit for some nice projects. I named the kit"A Naughty Rabbit". Have fun with it. And have a terrific weekend, spend it the way you like and don't bother too much about what other people might think of it! LOL. Yes, we still cannot really complain about the weather. Although sometimes grey, and windy, the temps are bearable. hey do predict a little fall of temperature towards the weekend, it might even freeze a little during the night then. But it seems, that;s only for a moment and then temps should rise again . I truly hope so. I see no point in getting real winter weather now, brrrrrr. There isn;t much to tell today, so I think I will keep it a short post. May be we will go to the market today, if the weather improves a little bit later today. And I must not forget to phone a friend who's having her birthday today. And I hope the day will not be too sad for her, cause she has a very sick cat. She phoned me for my birthday on Sunday and told me about it. She had to go to the vet on Monday again, and if not better she had to decide to put the poor little creature "to sleep". And I know how hard that can be. So it might be, that I have a very sad conversation tonight with her, but it might help her to talk about it. Time for the freebie. 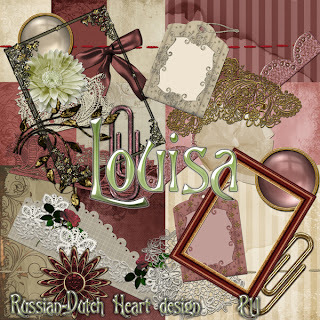 I have the kit "Louisa"for you. Hope you will have some use for it. After posting Friday, I got dressed, Jan and I got ourselves a cup of coffee and then Jan started to get all the boxes down to put in the Christmas stuff. We cleared away a lot, just the manger and the tree had one more day. It sure looked already quite different in the room! Saturday morning I did the tree and manger, all was nicely in their boxes, Jan helped to re-organize the room a bit and put away the boxes. When he did that, I was out to get me some groceries, it was a quick tour, just to get the necessary. When back home I pulled out the vacuum cleaner and the room looked nice again. Also the washing machine was in full process, with all the plaids and napkins etc. in it from Christmas, so that I can put them away fresh and well for next Christmas. We did the clearing in a slow tempo, but it sure is done much quicker than the decorating! And yesterday was my birthday. Oh we didn;t do anything special, I just finally could unwrapped a present from my friend Edna, that she already sent me together with the Christmaspresents. And if the real cold would come, I have noneed to be concerned to go out, she send me a lovely set of a cap, shawl, and gloves in a lovely teal colour with white embroidery one it. Got some sweet mails, and telephone calls and in the afternoon my friend Heidi and Séverine came by for a little birthday visit. Thanks also everyone who left me a little birthdaywish here! So no big party, but cosy at home and I loved it. There even was speedskating, the European Championships, on tv, so what else could I wish for LOL? 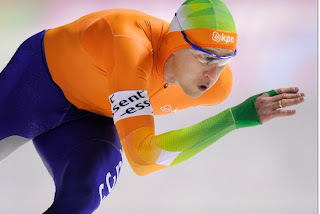 And our best male skater, Sven Kramer, back after a long period of absence due to an injury, is really back again! He's European Champion allround speedskating again!Yeah!!!! Well, all the holiday fuss is over again, we'll have to look forward again and hope for a good year. For a lot of people it will be a difficult year, I am sure, talking of finances. There still is a financial crisis going on, and the effects of it will be felt everywhere. No, I will not start a depressive talk, we will just have to see what this year will bring us and undergo it ROFL. Okay, time to get a few things done here, e.g. I have some ironing to do, not one of the favourite things, grin grin, but needed. And perhaps I can work a bit today on a new started kit. 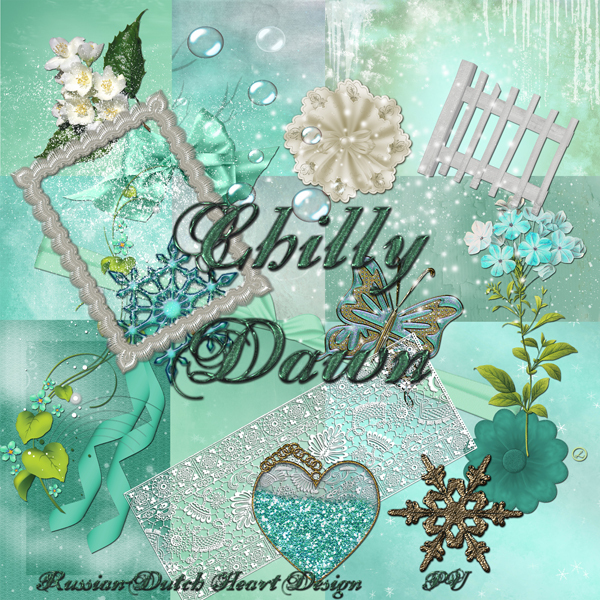 This little kit is a bit inspired by the soft weather we had till now. 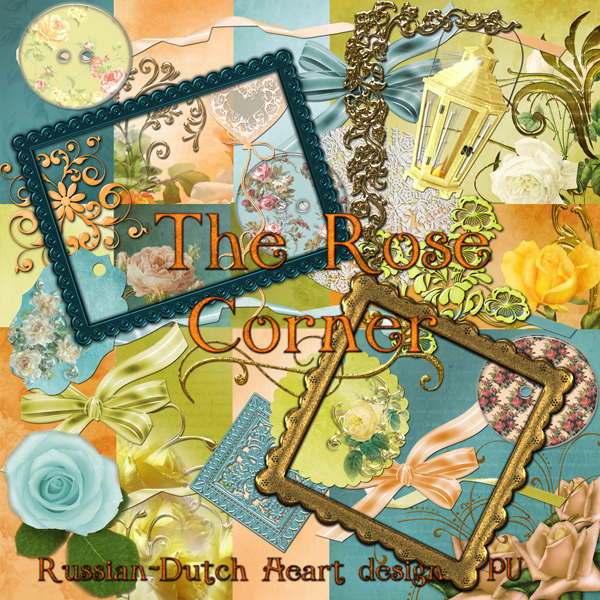 Perhaps you visit my friend Enda's blog sometimes and saw she made a couple of lovely pictures of a rose, that still was blooming so late in the year. Well, I have a bush with white roses and it still has some roses blooming too! Unbelievable! 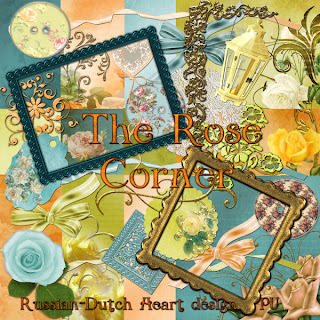 So hoorray for the strong roses and I've made a kit with roses named "The Rose Corner". Yes, today I have to put the statues of the 3 Kings in the manger. And tomorrow will be the great "cleaning day"LOL. I thought, that may today I will already clear a part of the Christmas decorations into their boxes again, so that we don;t have to do it all tomorrow. I am not making any fuss for dinner today, we always take that easy on Friday. May be I will make some thin pancakes, could put in a bit of apple and then with sugar or melasse it will be good enough for today. WOW, there are a few tricky situations in Holland now because of the storm and rain. At some places the water in rivers and lakes etc. reached a level that it floods over the edges, in some little towns they have to work with sand sacks, to keep the water away. It's a bit difficult to regulate the water level at the moment, because of the wind direction. As e.g. in the north of Holland the water is pomped into the Waddenzee(part of the North Sea, but at the moment it can;t be done, because the wind comes from sea, very hard, driving the waves high up to the coast, so no possibility to let the overcapacity flood into the sea. It hasn;t been this way for a long time, not that it is very critical yet, and it's expected that today and tomorrow there will be less rain and less wind, so may be in the next couple of days they can regulate the water level to a more "normal"one. I saw some fragments of the coast on tv and I sure liked to go to the sea to watch the force of nature and the wild sea, but it's better I stay home ROFL. With force 8 or 9 of wind and in the open air, I wouldn;t be able to walk, no progress when going against the wind and when walking with the wind in the back, Kyra would probably be flying around, grin grin. So here we have suddenly too much rain in short time and in Australia there are bush fires again. Then you see that man can control a lot, but fighting against nature's forces always is very difficult. May be some of you know the tv series "LIFE"? It's an awesome documentary about all life on earth, flora and fauna, how it survives, and how one almost cannot be alive without the other. Yesterday there was another part that I watched, mostly about plants and trees, how they grow, in what circumstances and what tricks nature has to assure there will be a next generation. The pictures are awsome, I just love to see that kind of documentaries. During the night, it must look very cosy in our bedroom, LOL! Not only Jan and I are sleeping in the bed, also our two cats are lying on the bed on a warm fleece blanket, hahahaha. They do go out for a little walk in the garden to respond to "nature's call", but with the kind of weather we are having at the moment, they do like to be comfy and warm and safe near us. Well, I don;t mind it too much as long as they stay at the footend. Okay, I should get busy in a short while, if I want to do all I have in mind, so I leave you in peace, with a little kit in wintery style " Crispy Dawn". Oh, I hope my shoutbox is working okay now? As far as I can see, it does, and I used Firefox as well as Internet Explorer, to take a look at the shoutbox. Reloaded the html-code again, so hopefully it's working now for everybody. Have a great weekend, see you again on Monday, although I will be one year older, snif snif!! Another year in your life, I hope it brings you all positive things!!!!! Oh my, it was a really wet and windy day yesterday. And exactly that day Heidi chose to go to her mother, with the family, and called me to ask if we could take care of their doggie, to let him out in the afternoon. Well, of course I said yes, and then first Jan said he would do it, then I decided to go with him, to at least have a bit of fresh air. Well, we did have that and lots more LOL! There was blowing a strong wind, in other parts of the country, mainly in the north, it was even a fearce storm, and it was raining. You could say it was raining cats and dogs, LOL, and even the doggie wasn;t happy to be outside. So we didn;t make a very large tour, and coming home at Heidi's, I rubbed the little thing a bit dry, gave him a few treats and then left again. By the time we were home, I decided I better could change my trousers into a warm and dry pair of jogging trousers. And you know what? After about half an hour the rain stopped and even some blue sky peeped out! Yeah, we were soooo lucky again, grin grin! Still not to complain too much, as the temperature is still on the "warm"side. Hope it works. I didn;t try it out yet. Just a couple of days more to enjoy the Christmastree, then get rid of all that stuff quickly and have a "normal"room again at my birthday. Yeah, that's an even that comes back every year for sure. Hmmm, the 8th of January I will have the respectable age of 59 then. Horrible, just this year and then no number 5 again as first, brrrrrrr. And again Jan will be living together with an older wife, but.........only for 3 weeks and then it will be his turn!!!ROFL. It's getting time to get busy for me here, it looks as if it will stay about dry today, still a bit windy, but if that's all, I can go out to pick up some groceries. And probably a bit of ironing will be a good thing to do. 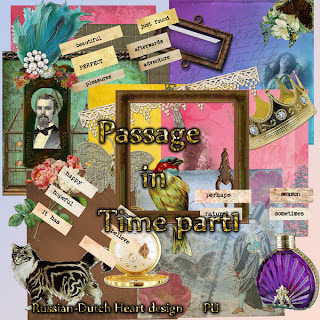 Today I offer you the second part of the "Passage in Time"kit. The year 2012, what will it bring us? Everybody a very happy New Year! I wonder what it has in store for us. I can just hope it will bring us some real luck, a good health as one of the most important things. 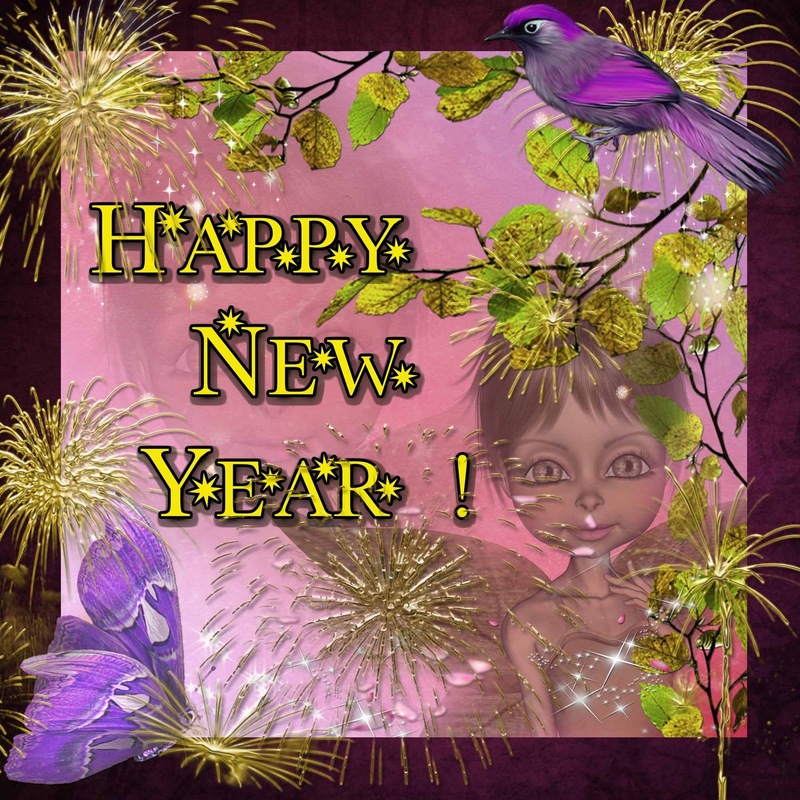 I have made no resolutions for this new year, well, perhaps just a couple, stuck away deep in the corner of my brain, LOL, but in whole we will just see what will pass our way and grab chances if they appear. Our New Year's Eve was a very quiet one, but cosy. I only felt so sorry for our two cats. They were rather nervouw already during the day and in the evening they stayed in the whole time, very close to us. Fireworks are no good to them! Traditionally we watched the New Years concert from Vienna yesterday, again surrounded by our cats, catching some sleep,they seemed to be completely exhausted from the day before, poor things. The whole day was quiet, and in the evening we watched to very exciting semi finals of the World Master Championship of darts! And now we will have to pick up with our "normal" life of every day again, after the holiday season. Just a few days more to enjoy the Christmastree, till the 6th of January, the day of the 3 kings arriving at the manger. Then the day after it will be time to put all the Christmas decorations back to their boxes. Last Friday I just made a quick phonecall to hear how Heidi and family were doing. That wasn;t too great. Séverine was given some antibiotics for her bad flue, but it seems she is allergic to it. Heidi told me that she was covered with little red spots, which were very itching. So after speaking to her doctor, she had to quit the antibiotics, and pick up a sirop for her bad coughing. Danny also wasn;t doing to great, also still coping with the flue and because he had to cough too rather severe, he now has an acking back. Hopefully they are feeling a bit better today, I will make a call later today again. Okay back to business now! Another year ahead of us of blogging and designing and I hope we can have a lot of fun together. 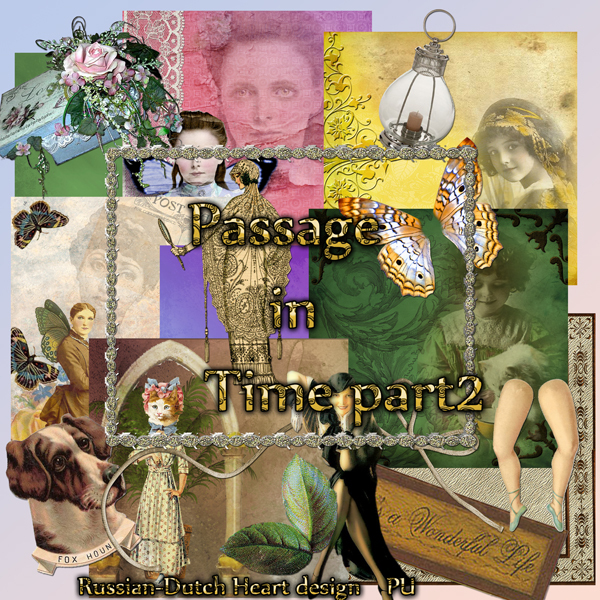 To start of this new year I have a kit for you in two downloads, named "Passage in Time". The second download will be on Wednesday. Now I slowly will get "to life"ROFL, after I have another cup of coffee, then will get dressed and think about the things I could do today(sounds very promising, just "think", grin grin). 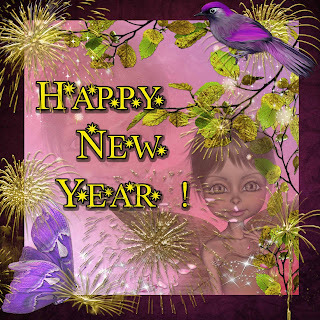 I hope you all had a wonderful start of 2012, enjoy the day!